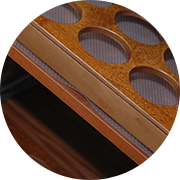 WOMEB is a company manufacturing various types of furniture for the shipbuilding industry, focusing on high-standard veneer furniture. The profile of operation of WOMEB is connected with the demand and the specifity of the region influenced by the shipbuilding industry. The company was established in 1987. It was founded by its owner Włodzimierz Dudko, Msc.Eng. The deep-rooted experiences and a strong emphasis on the quality of final product in the combination with the constantly modernized stock of machinery allowed achievig a well-established position of WOMEB in the shipbuilding industry. The effects of our work in the shipbuilding sector have been noticed by foreign ship owners who ordered in WOMEB furnishing their ships built both in Poland and abroad. WOMEB manufacture light furniture using materials with certificates. The reduction of their weight (comparing light furniture with those normally made) is 30% - 60%; light furniture have the same looking like and properties as traditional furniture. Light furniture are used in shipbuilding, railway and aviation. WOMEB is the producer of not typical furniture: to restaurants, to hotels and other not typical furnishing. We furnished many places in Gdańsk, Gdynia and Hel Peninsula and other. 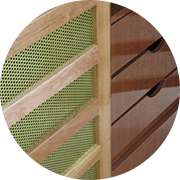 We produce the furniture basing on delivered designs or the designs worked out in WOMEB. Firm WOMEB manufacture furniture ordered for ships. We are the producers of wooden furniture and furniture made from plywood or other plates They are finished with natural veneer or high quality laminates which have suitable certificates for sea. Firm WOMEB as the only producer worked out the technology of producing the light furniture. The light furniture can be used instead of traditional furniture in all conditions and their weight can be reduced ~ 30-60 %. 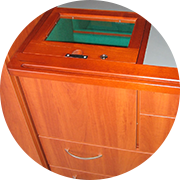 The light ship furniture are produced from materials which have suitable certificates for sea. Firm WOMEB offer furniture for not typical solutions basing on individual designs.